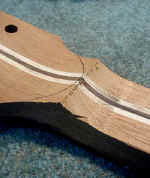 Here I am beginning to fine tune the shape of the neck - here the volute at the peghead- using a fine tooth half round rasp. 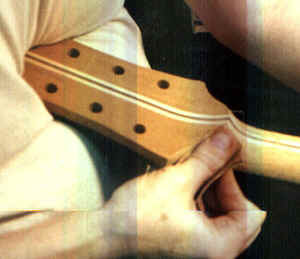 This is a rather nice file - made by Nicholson- which I dearly love. It can cut aggressively and yet, with the proper touch, leave quite a fine finish as well. 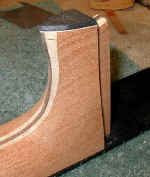 Here is the heel for a cutaway that is all machine work (band saw and spindle shaper). 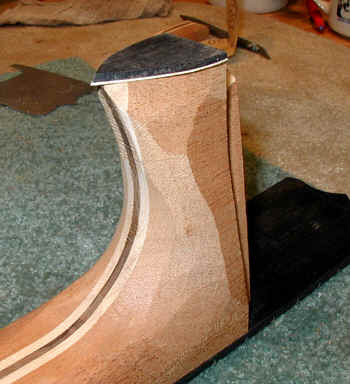 Here is a heel that I have "hand shaped" on the end of my belt sander. 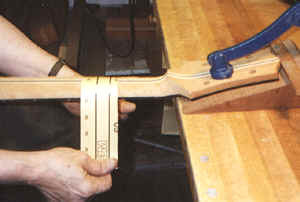 I find that this is a very effective and efficient tool - I can go from a machine shaped heel to this point in perhaps 3-4 minutes. 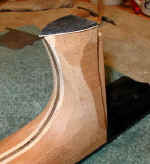 This is the same heel after I have refined it with a file. 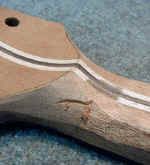 Here is the volute with just machine work. A volute that has been sanded on the belt sander. 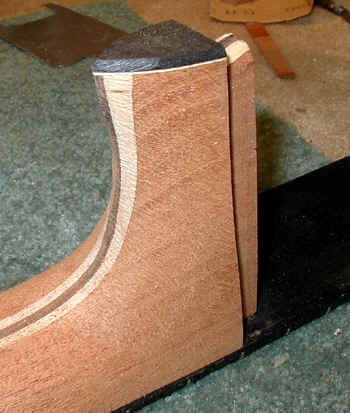 And a volute that has been refined with the file (rasp). 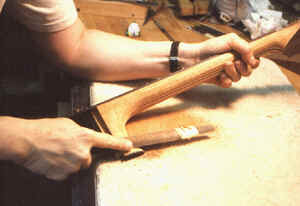 More of the same, here working on the heel. I think a finely shaped, delicate heel is essential to a good looking guitar. 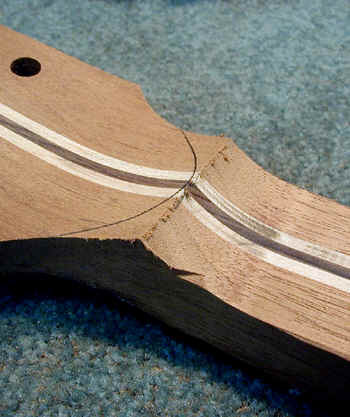 After the neck is brought very close to shape with a spokeshave and file, I begin the sanding process. 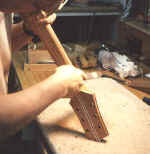 I start with a technique which I think of as shoe shining. 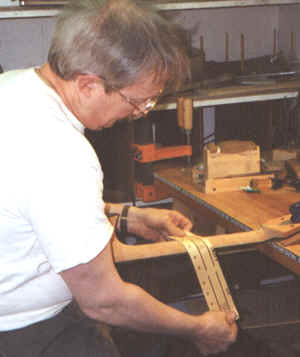 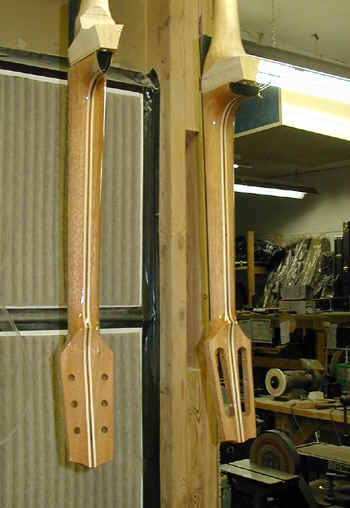 A strip of 60 grit sandpaper is used like a shoe shine cloth and very quickly smoothes the shaft of the neck and makes the curves smooth and uniform. 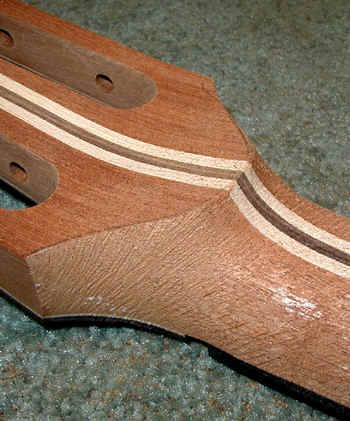 There is a lot of pure hand sanding as well. Getting all the curves smooth and fair is time consuming but necessary.